Colombo Stock Indices recovered marginally on Wednesday the 23 February 2011 amidst renewed retail interest witnessed in counters such as GRAN, GLAS, RICH, TAFL etc. Thin volume trading continued while institutional and high networth investors were more on the selling side according to brokers. The All Share Price Index (ASPI) closed at 7,548.86 points, shot up 0.45% by 34.12 points and the Milanka Price Index (MPI) closed at 7,181.13 points, rose 0.29% through 20.75 points during the day. 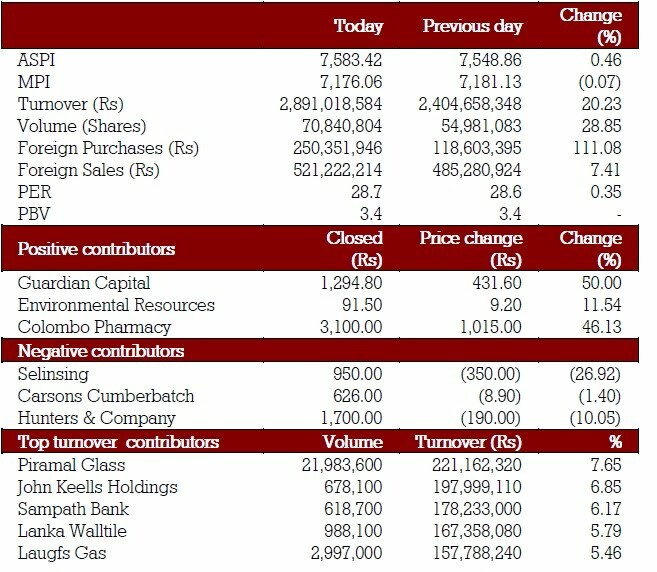 Total turnover was at Rs.2.4 billion (rose 13.15%) with a volume of 54.98 million shares changing hands (topped 12.9%). Foreign purchases dropped 18.71% to Rs.118.6 million and foreign sales appreciated by 45.11% to Rs.485.28 million. Meantime, Price to forward Earnings Ratio (PER) appreciated 0.7% to 28.6 times. Diversified and Manufacturing sectors were the highest contributors to the market turnover while sector indices increased by 0.09% and 1.07% respectively. Premier conglomerate John Keells Holdings (JKH) made the highest contribution to the market turnover with five crossings of 781,600 shares at Rs.291 while the share price decreased by Rs.1.20 (0.41%) and closed at Rs.292. 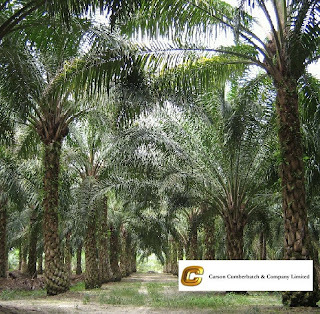 Crossings were recorded including two crossings of Cargills (Ceylon) (CARG) 257,000 shares at Rs. 234, Horana Plantations (HOPL) 350,000 at Rs.80 and Ceylinco Insurance (CINS) 36,500 shares at Rs.550 per share. Finlays Colombo (JFIN) announced a final dividend of Rs.1.50 per share. Globally, Asian stock markets were mixed, weighed by Wall Street's sharp 1.4% fall yesterday and continued political turmoil in Libya. Nikkei dropped 0.8%. Sri Lankan Secondary Debt Market three and six months yields were slightly down in the Treasury Bill primary auction. Secondary market Treasury bond yields were slightly up, while the market activity was relatively high. Sri Lankan Rupee was stable as the exchange rate was recorded at Rs.110.88 to Rs.110.90 per US Dollar. 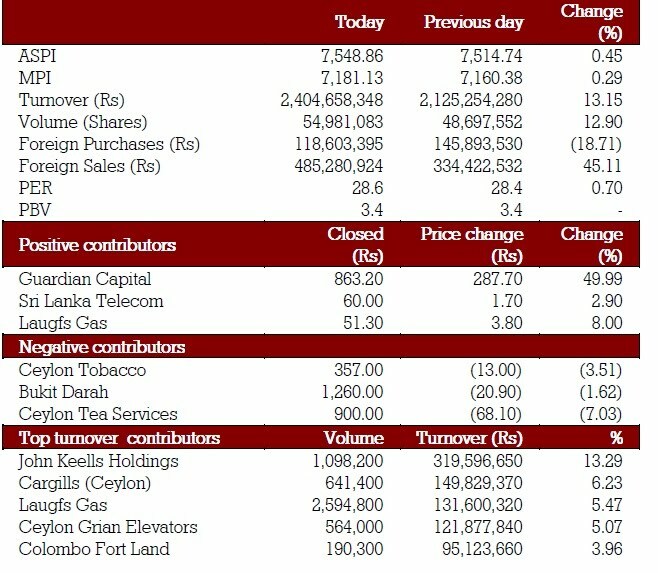 Indices continued to dip with thin volumes after the rapid gains made over the last few weeks at Colombo Stock Exchange on Tuesday the 22 February 2011. However, retail investor interest was shown in counters such as LWL and RHTL despite the profit taking across the board. The All Share Price Index closed at 7,514.74 points, fell 1.37% by 102.45 points and the Milanka Price Index (MPI) closed at 7,160.38 points dropped 1.09% through 78.94 points during the trading day. Total turnover was at Rs.2.1 billion fell 6.15% with a volume of 48.6 million shares changing hands (fell 14.50%). Foreign purchases dropped 13.32% to Rs.145.8million and foreign sales rose 74.16% to Rs.334.4 million. Price to forward Earnings Ratio (PER) recorded to be 28.4 times (dipped 1.39%). Diversified and Bank, Finance & Insurance sectors were the highest contributors to the market turnover while sector indices decreased by 1.96% and 1.19% respectively. Aitken Spence & Co. (SPEN) made the highest contribution to the market turnover with three crossings of 778,000 shares at Rs.170 while the share price increased by Rs 0.40 (0.23%) and closed at Rs.170.90. Foreign holding of the company decreased by 910,597 shares. 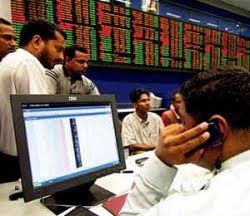 Several crossings were recorded including 3 crossings of John Keells (JKH) 300,000 shares at Rs.292, two crossings of Sampath Bank (SAMP) 300,000 shares at Rs.292.50 and 350,000 shares of Lanka Walltile (LWL) at Rs.165 per share. Seylan Bank (SEYB) announced a first & final interim dividend of Rs.1.00 per share.NTB Bank (NTB) announced a first & final dividend of Rs.2.00 per share. Globally, European stocks plunged as the escalating tension in Libya continued to damage investor confidence and boost oil prices. FTSE 100 fell 1.2%. Sri Lankan Secondary Debt Market Treasury bond yields were slightly up, while the market activity was marginally high. Sri Lankan Rupee depreciated slightly as the exchange rate was recorded at Rs.110.88 to 110.90 per US Dollar. 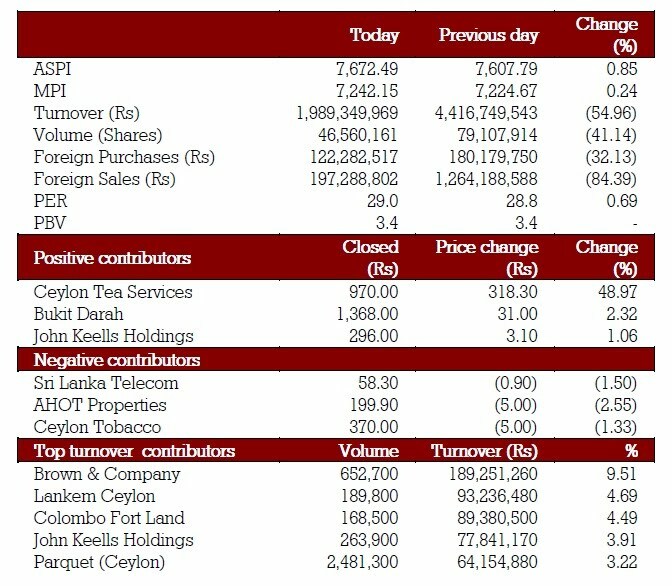 A lackluster market was witnessed at Colombo Stock Exchange on Friday the 18 February 2011 as investor activity was subdued by the mid week holidays. 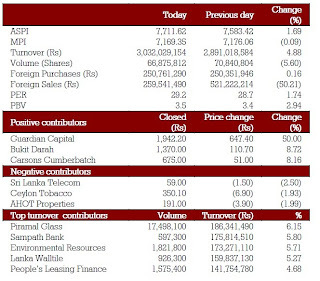 However, indices gained amidst a response to the positive interim results. The week ended with All Share Price Index (ASPI) gaining 1.13% and Milanka Price Index (MPI) dipping 0.24%. The All Share Price Index (ASPI) closed at 7,672.49 points, rose 0.85% by 64.70 points while the Milanka Price Index (MPI) closed at 7,242.15 points, increased 0.24% by 17.48 points during the day. 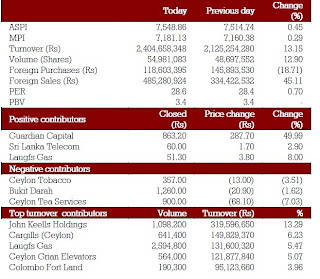 Turnover was at Rs.1.9 billion decreased by 54.96% and a total volume of 46.5 million shares changed hands dipped 41.14% compared to earlier market day. Foreign purchases dipped 32.13% to Rs.122.28 million and foreign sales also fell 84.39% to Rs.197.28 million. Price to forward Earnings Ratio (PER) rose 0.69% to 29 times. Bank, Finance & Insurance and Diversified sectors were the highest contributors to the market turnover while indices increased by 0.65% and 0.83% respectively. Brown & Company (BRWN) made the highest contribution to the market turnover while the share price increased by Rs 20.40 (7.43%) and closed at Rs 296. A crossing was recorded for 300,000 shares of Asian Alliance (AAIC) at Rs.154. Union Assurance (UAL) announced a final dividend of Rs.6.20 per share last Tuesday. Asian Alliance (AAIC) announced a final dividend of Rs.3 per share last Tuesday. Globally, U.S. stocks finished higher after a white-hot reading from mid-Atlantic manufacturers outweighed jobs figures and a rise in U.S. consumer prices. Dow gained 0.24%. Asian stock markets were mixed today while tensions in the Middle East capped buyers in the Tokyo market. Nikkei was up 0.1%. Sri Lankan Secondary Debt Market Treasury bond yields were flat, while the market activity was dull. 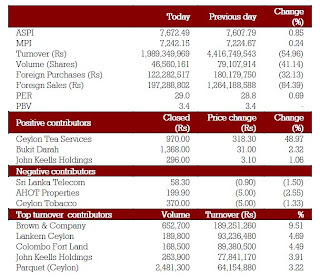 Colombo stock indices dipped sharply during early trading on Tuesday the February 15th with corrections made on counters of Carsons owned subsidiaries which experienced a sudden appreciation on earlier day. However, buying pressure was witnessed in counters such as LCEY, HVA and some Motor sector stocks. Shares fell drastically while the All Share Price Index (ASPI) closed at 7,607.79 points, down 2.61% by 204.03 points and the Milanka Price Index (MPI) fell 0.33% by 24.14 points closing at 7,224.67 points. A volume of 79.1 million shares changed hands (down 12.74%) recording a turnover at Rs.4.4 billion, foreign purchases fell 90.69% to Rs.180.1 million and foreign sales also tumbled 39.61% to Rs.1.2 billion. Price to forward Earnings Ratio (PER) dropped by 2.37% to 28.8 times. Beverage, Food & Tobacco and Motor sectors were the highest contributors to the market turnover while indices decreased by 0.34% and 2.99% respectively. 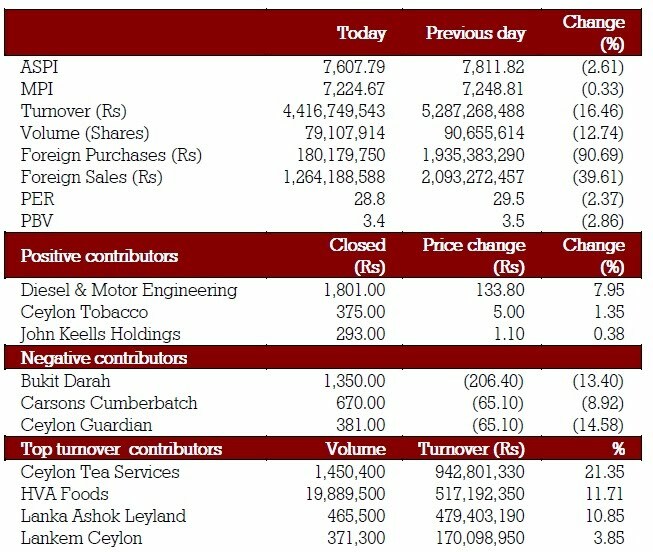 Ceylon Tea Services (CTEA) made the highest contribution to the market turnover while the share price decreased by Rs.150.00 (18.75%) and closed at Rs.650. Foreign holding of the company decreased by 1,450,400 shares. HVA Foods (HVA) commenced trading made contribution significantly to the market turnover. The share price increased by Rs.10.10 (63.13%) and closed at Rs.26.10. Several crossings were recorded including two crossings of Commercial Bank (COMB) 350,000 at Rs.277, two crossing of John Keells Holdings (JKH) 177,000 shares at Rs.290 and 200,000 at Rs.291.00 with E-Channelling 1,286,500 shares at Rs.21.50. Hapugastenne Plantations (HAPU) announced a final dividend of Rs.2 per share. Talawakelle Tea Estates (TPL) announced a final dividend of Rs.2.50 per share. Property Development (PDL) announced a final dividend of Rs.2 per share. Sri Lankan Secondary Debt Market Treasury bond yields were mostly flat, while the market activity was dull. Sri Lankan Rupee appreciated slightly as the exchange rate was recorded at Rs.110.99 to Rs.111.00 per US Dollar. Investors responded well to the positive interim results on Friday the 11 February, 2011 to lift All Share Price Index (ASPI) over 100 points during early trading. However, momentum was subdued and market became stagnant as profit taking took place on counters such as TYRE. ASPI and MPI gained 3.26% and 1.10% for the week respectively according to brokers. The All Share Price Index (ASPI) closed at 7,586.63 points, rose 1.24% by 93.01 points and the Milanka Price Index (MPI) closed at 7,259.81 points, increased 0.41% by 29.46 points during the day. 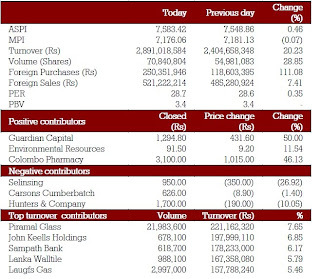 Total turnover was at Rs.3.8 billion fell 24.52% with a volume of 96.33 million shares changing hands (down 15.58%). Foreign purchases rose 7.51% to Rs.197.6 million and foreign sales declined 59.48% to Rs.294.1 million. Price to forward earnings Ratio (PER) appreciated 1.41% to 28.7 times. Manufacturing and Diversified sectors were the highest contributors to the market turnover. Manufacturing sector index decreased by 0.12% while Diversified sector index increased by 0.57%. Kelani Tyres (TYRE) made the highest contribution to the market turnover while the share price decreased by Rs.5.90 (12.94%) and closed at Rs.59.20. 14.8 million shares changed hands of TYRE with a contribution of Rs.875.2 million to the market turnover. Several crossings were recorded including Dialog Axiata (DIAL) 5 million shares at Rs.12, Commercial Bank (COMB) 150,000 shares at Rs.277.00, DFCC Bank (DFCC) 106,000 shares at Rs.190, Colombo Dockyard (DOCK) 91,000 shares at Rs. 275. Dialog Axiata (DIAL) announced a final dividend of Rs.0.20 per share. Aviva NDB Insurance (CTCE) announced a final dividend of Rs.9 per share..
Globally, European stocks were mostly lower today while euro-zone debt concerns and unrest in Cairo also continued to weigh. FTSE 100 Index was flat. Sri Lankan Secondary Debt Market Treasury bond yields slightly increased, while the market activity was relatively low. Sri Lankan Rupee depreciated slightly as the exchange rate was recorded at Rs.111.04 to Rs.111.06 per US Dollar. 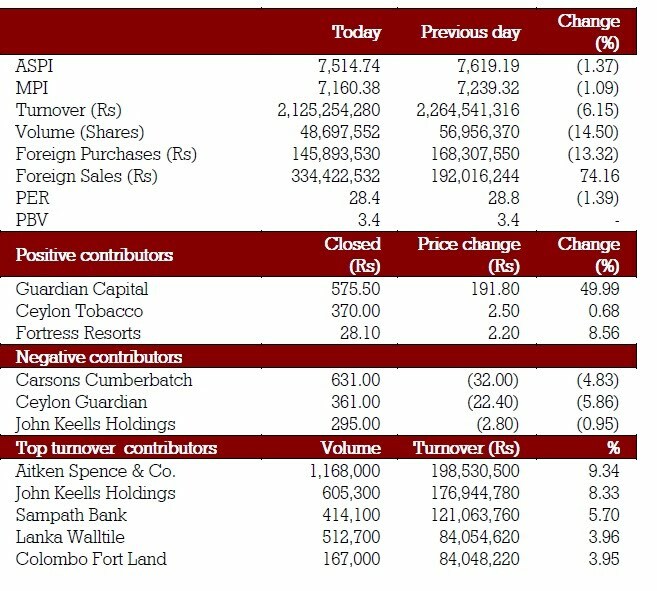 Institutional and high networth investor participation was witnessed during early trading on Thursday the February 10, 2011 while a fresh round of retail buying further boosted All Share Price Index (ASPI) during the latter part of trading according to brokers. “Milanka Price Index was choppy during the day but ended on a positive note” brokers said. The All Share Price Index (ASPI) closed at 7,493.62 points, rose 1.57% through 116.18 points and the Milanka Price Index (MPI) closed at 7,230.35 points, appreciated 0.37% by 26.60 points. 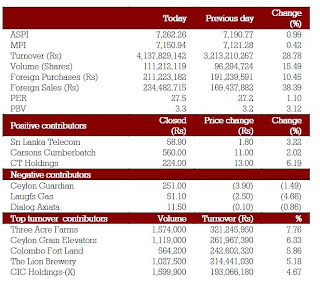 Turnover recorded to be Rs.5 billion rose 14.14% and a total volume of 114.11 million shares changed hands (up 9.83%). Foreign purchases dropped 3.8% to Rs.183.8 million and foreign sales further decreased to 42.88% to Rs.725.88 million. However, Price to Forward Earnings Ratio (PER) slightly rose by 1.43% to 28.3 times. Bank, Finance & Insurance and Manufacturing sectors were the highest contributors to the market turnover while both indices increased by 1.26% and 0.88% respectively. Commercial Bank (COMB) made the highest contribution to the market turnover with a crossing of 990,600 Rs.278.50 while the share price increased by Rs 0.90 (0.32%) and closed at Rs.278.50. Several crossings were recorded including two crossings of 1.05 million shares of Ceylon Grain Elevators (GRAN) at Rs.250, two crossings of Royal Ceramics (RCL) 125,000 shares at Rs.161.50 and 564,000 shares at Rs.160.50, Hemas Holdings (HHL) 2,000,000 shares at Rs.51, Nawaloka (NHL) 15 million shares at Rs.4, Sampath Bank (SAMP) 200,000 shares at Rs.290, John Keells Hotels (KHL) 2 million shares at Rs.18.70 and Lanka Walltile (LWL) 150,000 shares at Rs.165. EB Creasy (EBCR) announced an interim dividend of Rs.4 per share and Diesel & Motor Engineering (DIMO) announced an interim dividend of Rs.5 per share with Kelani Valley (KVAL) announcing a final dividend of Rs.4 per share, on 9th February. Among the quarter results ended in 31 December 2010, Nawaloka Hospitals (NHL) net profits had increased by 245% to Rs.60.94 million from Rs.17.67 in 2009, Parquet Ceylon (PARQ) had recorded a Rs.23.98 million net profit reaching 620% against 2009 results which was at Rs.3.33 million. Meanwhile, Environmental Resources (GREG) net profit had shot up by 2112% to Rs.486.68 million from Rs.22 million in 2009. Consequently other subsidiaries of Environmental Resources PLC, Ceylon leather (CLPL) had recorded a net profit at Rs.36.80 million at 373% compared to Rs.7.78 million in 2009, Dankotuwa Porcelain (DPL) recording a Rs.18.19 million net profit at 142% from a loss of Rs.42.87 million in 2009 while The Colombo Pharmacy (PHAR) has reported a profit of Rs.3.37 million compared to Rs.4.54 million in 2009 down by 26%. Globally, Most Asian shares retreated in early trading Thursday as a mixed finish on Wall Street offered little incentive to buy.Benchmarks in Taiwan, Singapore and New Zealand were also down. Meanwhile, the Shanghai Composite index turned higher after a negative start and was up 0.2 percent at 2,778.60. The optimism was triggered by news that the London Stock Exchange Group PLC and TMX Group Inc., which operates the Toronto Stock Exchange, are merging to create one of the world's largest stock markets. NYSE Euronext Inc., which also operates exchanges in Europe, also said it is in "advanced discussions" about a possible merger with Deutsche Boerse, owner of the Frankfurt stock exchange. In New York stocks finished mixed after the head of the Federal Reserve said unemployment may remain high for several years. The Dow Jones industrial average rose 6.74 points, or 0.1 percent, to 12,239.8 in its eighth straight day of gains. The broader Standard & Poor's 500 lost 3.69 points, or 0.3 percent, to 1,320.88. It was the first down day for the index after four days of gains. The Nasdaq composite lost 7.98, or 0.3 percent, to 2,789.07. Negotiated deals (foreign sales) pertaining to Commercial Bank coupled with retail profit taking weighed on All Share Price IndexI during early trading on Wednesday the 9, February 2011, diluting gains in other counters. However, gains in some large & mid-cap counters edged the MPI up according to brokers. The All Share Price Index (ASPI) closed at 7,377.44 points, fell 0.10% by 7.60 points and the Milanka Price Index (MPI) of more liquid stocks closed at 7,203.75 points, rose 0.06% by 4.66 points during the day. Total turnover was Rs.4.41 billion ROSE 1.18% with 103.8 million shares changing hands (dipped 20.85%). Foreign purchases recorded to be Rs.191 million (up 6.32%) and foreign sales topped 308.36% at Rs.1.27 billion. However, price to forward Earnings Ratio (PER) was stable at 27.9 times. Bank, Finance & Insurance and Manufacturing sectors were the highest contributors to the market turnover. Bank, Finance & Manufacturing sector index decreased by 0.64% while Manufacturing sector index increased by 0.35%. Commercial Bank (COMB) made the highest contribution to the market turnover with nine crossings of 3,909,850 shares at Rs.277. The share price decreased by Rs.1.80 (0.65%) and closed at Rs.278. Several crossings were recorded including two crossings of Royal Ceramics (RCL) 730,000 shares at Rs.161, Pan Asia Bank (PABC) 464,000 shares at Rs.58.50 and Aitken Spence Hotels (AHUN) 200,000 shares at Rs.105. Globally European stocks were mixed today after the recent strong gains as investors digested key earnings. FTSE was down 0.3%. Hong Kong stocks declined to lead most Asian markets lower today on fears Beijing may launch more policy restrictions in coming months after raising interest rates late on previous day. Sri Lankan Secondary Debt Market, three months yields were slightly down in the Treasury Bill primary auction. Secondary market Treasury bond yields slightly dipped, while the market activity was relatively high. 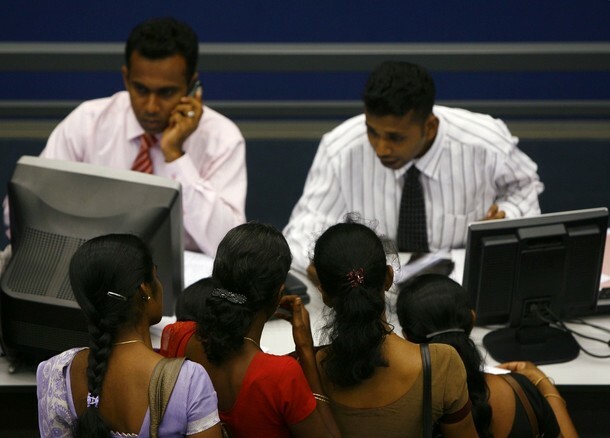 Sri Lankan Rupee was stable as the exchange rate was recorded at Rs.110.98 to Rs.111.00 per US Dollar. Colombo Stock Market was volatile in early trading on Tuesday the 8 February, 2011 as investors showed mixed sentiments. Buying pressure witnessed towards the latter part, helped All Share Price Index gain slightly. However, profit taking was witnessed in Poultry, Plantation and Manufacturing sectors and interest was witnessed in the Hotel sector according to brokers. The All Share Price Index (ASPI) closed at 7,385.04 points, rose 0.05% by 3.94 points and the Milanka Price Index (MPI) of more liquid stocks closed at 7,199.09 points, down 0.18% by 12.76 points during the trading day. Total turnover was at Rs.4.36 billion slightly fell by 0.66% with a total volume of 131.2 million shares changing hands with an increase of 6.81% compared to a day before. Foreign purchases declined 29.69% to Rs.179.7 million and foreign sales rose 31.14% to Rs.311.2 million. Meanwhile Price to forward Earnings Ratio (PER) was stable at 27.9 times. Diversified and Bank, Finance & Insurance sectors were the highest contributors to the market turnover. Diversified sector index decreased by 0.18% while Bank, Finance & Insurance sector index increased by 0.20%. Ceylinco Insurance (CINS) made the highest contribution to the market turnover with five crossings with 43,600 shares at Rs.460 and 625,000 shares at Rs.500. The share price increased by Rs.74.30 (17.48%) and closed at Rs.500. Several crossings were recorded including two crossings of Lanka Walltile (LWL) 490,000 shares at Rs.170, Sunshine Holdings (SUN) 950,000 shares at Rs.50, two crossings of John Keells Holdings (JKH) 200,000 shares at Rs.293 and 185,000 shares of Commercial Bank (COMB) at Rs.277 per share. Globally, financials led U.S. stocks higher yesterday as the market got a lift from a stream of deals and corporate earnings. Dow was up 0.6%. Japanese and Australian stocks ended at their highest levels in several months today. Nikkei rose 0.4%. Sri Lankan Secondary Debt Market Treasury bond yields slightly dipped, while the market activity was relatively low. Sri Lankan Rupee appreciated slightly as the exchange rate was recorded at Rs.110.98 to Rs.111.00 per US Dollar. 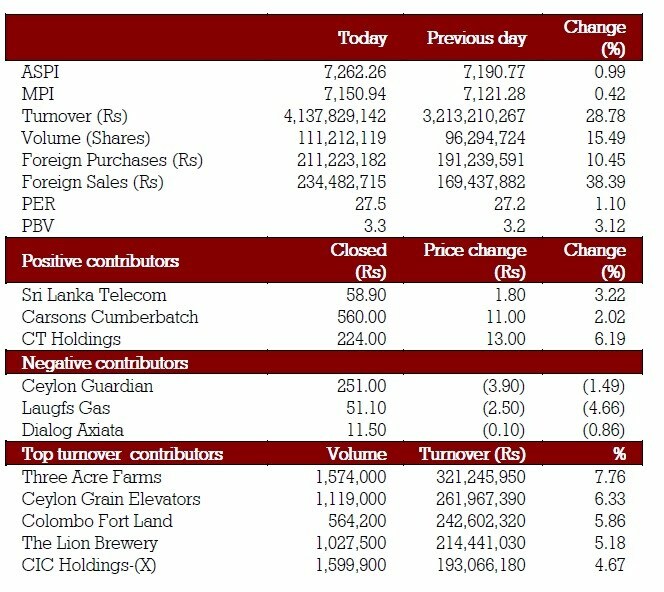 The week started with Colombo stock indices gaining on Monday the 7 February, 2011, extending the momentum from last week. Retail activity was witnessed in counters such as RICH, PCH, CLND while profit takers may have to move towards the blue chip counters to adjust the discrepancy between ASPI and MPI according to brokers. The All Share Price Index (ASPI) closed at 7,381.10 points, increased 0.47% 34.29 points and the Milanka Price Index (MPI) of more liquid stocks closed at 7,211.85 points, rose 0.44 percent (31.36 points) according to stock exchange provisional figures. 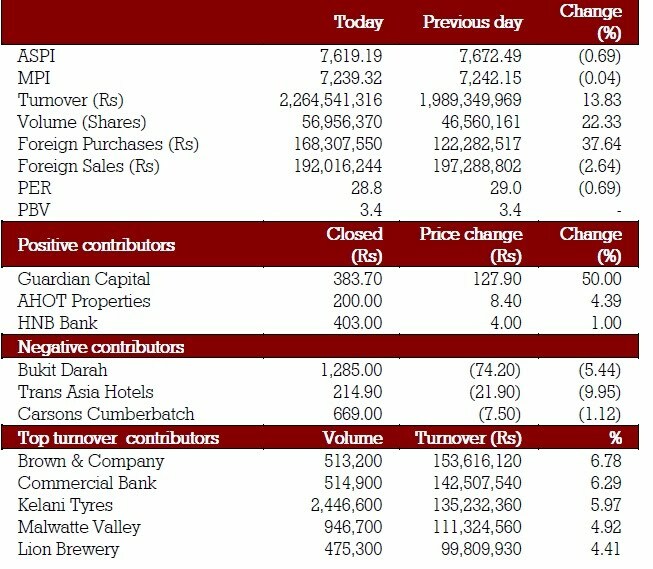 Turnover was at Rs.4.39 billion dipped 5.86% and a total volume of 122.89 million fell 10.06% compared to a day earlier. Foreign purchases rose 71.66% to Rs.255.6 million and foreign sales were recorded to be Rs.237.3 million fell 11.63%. However, Price to forward Earnings Ratio (PER) slightly appreciated 0.36% to 27.9 times. Diversified and Bank, Finance & Insurance sectors were the highest contributors to the market turnover while both indices increased by 0.89% and 0.60% respectively. 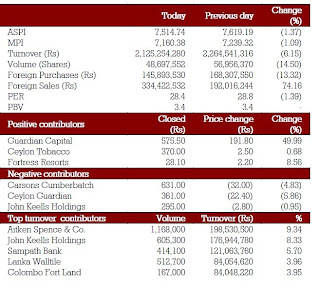 Richards Pieris (RICH) made the highest contribution to the market turnover while the share price increased by Rs.1.30 (9.35%) and closed at Rs.15.10. Several crossings were recorded including two crossings of John Keells Holdings (JKH) 455,500 shares at Rs.293, 454,600 shares of Laugfs Gas (LGL) at Rs.51, 25,000 shares of Central Finance (CFIN) at Rs.975, Lanka Walltile (LWL) 200,000 shares at Rs.170, Pan Asia Bank (PABC) 438,000 shares at Rs.59 and HNB Bank (Non-voting) (HNB.X) 138,000 shares at Rs.210 per share. CIC Holdings (CIC) announced an interim dividend of Rs.0.75 per share. Globally, European stocks were higher today, helped by gains on Wall Street and in Asia. FTSE 100 was up 0.7%. Japanese shares rose today as exporters got a lift from a weakened yen. Nikkei rose 0.5%. Sri Lankan Secondary Debt Market Treasury bond yields increased, while the market activity was high. Sri Lankan Rupee depreciated slightly as the exchange rate was recorded at Rs.110.98 to Rs.111.01 per US Dollar. 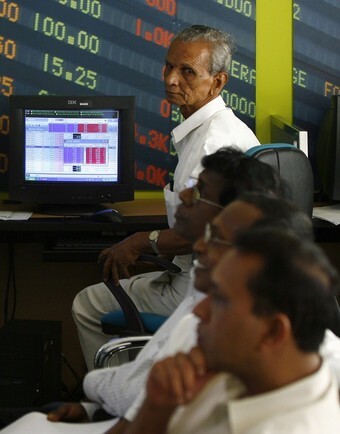 Sri Lanka stock indices gained amidst aggressive retail buying on Wednesday the 2 February, 2011. Stocks which created short term rallies in Poultry and Manufacturing sectors recently, witnessed further interest. Large cap counters continued to underperform small and mid caps which is a cause for concern according to brokers. The All Share Price Index (ASPI) closed at 7,262.26 points, up 0.99% by 71.49 points and the Milanka Price Index (MPI) closed at 7,150.94 points, up 0.42% by 29.66 points during the day. Turnover was at Rs.4.1 billion topped 28.78% with a total volume of 111.2 million shares changing hands rose 15.49%. Foreign purchases rose 10.45% to Rs.211.2 million and foreign sales also increased by 38.39% to Rs.234.4 million. Price to forward Earnings Ratio (PER) appreciated by 1.1% to 27.5 times. Manufacturing and Beverage, Food & Tobacco sectors were the highest contributors to the market turnover. While both indices increased by 1.68% and 1.36% respectively. Three Acre Farms (TAFL) made the highest contribution to the market turnover while the share price increased by Rs.34.70 (18.91%) and closed at Rs.53.90. 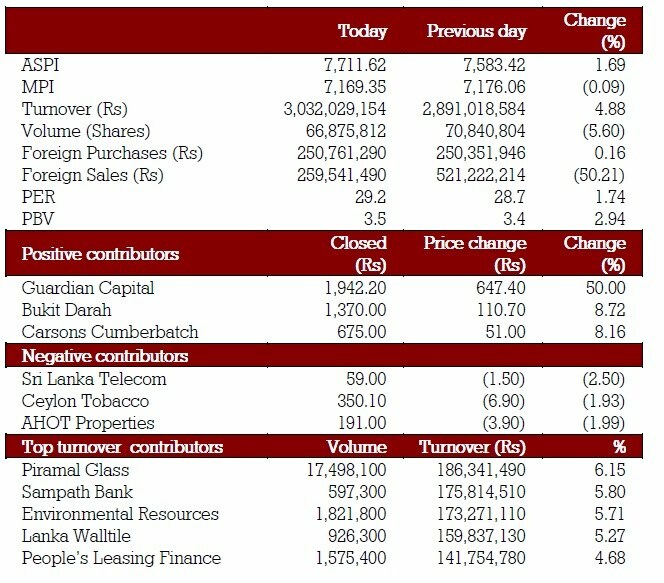 Three crossings were recorded including Lanka Walltile (LWL) 600,000 shares at Rs.165 and Laugfs Gas non-voting (LGL.X) 500,000 shares at Rs.40.50 and Sampath Bank (SAMP) 200,000 shares at Rs.299 per share. HDFC Bank announced an interim dividend of Rs.5.00 per share. 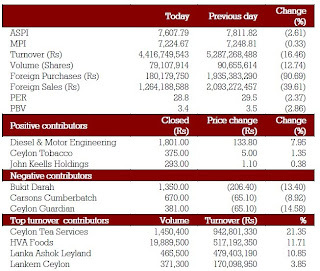 Among the positive contributors were Carsons Cumberbatch (CARS) which rose 2.02% by Rs.11 closing at Rs.560 and CT Holdings (CTHR) that rose by Rs.13 at 6.19% closing at Rs.224. Globally, the Dow Jones Industrial Average closed above 12000 on yesterday for the first time since June 2008. 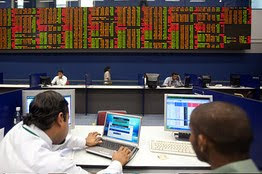 Asian markets ended higher today on solid Wall Street gains and as investors looked beyond the ongoing unrest in Egypt. Nikkei climbed 1.8%. Sri Lankan Secondary Debt Market Yields were marginally down in the Treasury Bills primary auction yesterday. Secondary market Treasury bond yields slightly decreased, while the market activity was high. Sri Lankan Rupee appreciated slightly as the exchange rate was recorded at Rs.110.95 to Rs.110.98 per US Dollar. Colomb Stocks closed the trading on Tuesday the 1 February, 2011 with active retail trading in the small and mid-cap stocks whilst the All Share Price Index (ASPI) closed at 7,190.77, shot up 0.22% by 15.90 points and the Milanka Price Index (MPI) closed at 7,121.28, dipped 0.18% through 12.99 points. Total turnover recorded to be Rs.3.2 billion and a total volume of 96.1 million shares changed hands. Foreign purchases were at Rs.191.2 million and foreign sales recorded to be 169.4 million. Price to forward Earnings Ratio (PER) was 27.2 times during the trading day. Fort Land (CFLB) made the highest contribution to the market turnover with nearly one million shares changing hands at Rs.385.5 million in total. Among the positive contributors were Hunters (HUNT) that closed at Rs. 1599 rose Rs.239 at 17.57 while Fort Land (CFLB) reached high at Rs.402 up 11.59% by Rs.47.30 and Lankem Ceylon (LCEY) closed at Rs.368.60 rose 12% by Rs.39.50. 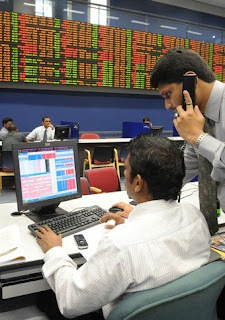 Actively trading in mid cap stocks such as Citrus Leisure (REEF) was witnessed that closed at Rs.102.40, rose Rs.7.50 with over 2.3 million shares changing hands and Laugfs Gas (LGL) closed at Rs.53.70, dropped by Rs.1.70 with seven million shares traded. Asian markets were flat to positive as the concerns over Egyptian turmoil fade and the US markets showed strong close overnight. Both the Nikkei and the Hang Seng were up moderately. The weekly primary auction for the week ending 4 February, 2011 for the re-issue of Rs.11 billion maturing Treasury bills saw heavy oversubscription with bids worth Rs. 21.5 billion received. Sri Lankan Rupee appreciated slightly as the exchange rate was recorded at Rs.111.08 to Rs.111.10 per US Dollar.